Chances are high that you have run a report in Google Analytics before and have come across a startling realization: you have a significant amount of traffic being labeled as “direct.” For many websites, this number is on the rise, and some sites have as much as 50% of this traffic of unknown origin. Believe it or not, much of this “direct traffic” isn’t really direct. A significant portion is likely something referred to as dark traffic. It is traffic that Google Analytics can’t place the source for, and ends up being grouped together with direct. This traffic can come from anywhere, but much of it is probably “dark social.” Almost 70% of all sharing activity happens outside of social media that Google can track accurately. The definition of direct traffic explains most of what you need to know. Google defines direct traffic as any traffic that doesn’t have referral information. That means that anything grouped under direct traffic is pretty much Google Analytics shrugging when you ask it where its traffic is coming from. Apps that access links natively, such as WhatsApp, Facebook, and Instagram, are all grouped as direct traffic. In addition, “direct” links from Outlook and other desktop clients aren’t delineated either. This can vastly skew your ability to track campaigns, including organic search and mobile browsing. If you’ve noticed that the campaign results of a newsletter or display ad vastly differed from the results Google Analytics told you, you are almost certainly the victim of dark traffic. It’s one thing to recognize what dark traffic is, it’s another thing to be able to shine a light on it and properly attribute it. 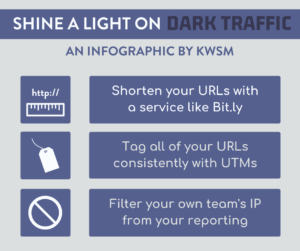 Here are a few ways you can lower the amount of your traffic that’s considered dark traffic. You may already be using shortlinks on platforms like Twitter if you’re using HootSuite or Buffer, which will automatically shorten your URLs and report the number of clicks in your reports. You should also be shortening URLs that go out through other channels, especially those you know will be opened in an app or desktop client. When it comes to shortening URLs, most turn to Bit.ly, as accounts are not only free, but having an account lets you customize the tail end of your URLs. You can easily distinguish between your links, make them easier for users to copy and paste, and track critical details like referrers and total clicks for particular links. Combining the details of your shortlink reports with your Google Analytics reports will allow you to illuminate where some of your dark traffic is coming from. At least a portion of your dark traffic is coming from your users simply copying your URL once they’re on the page, and then pasting it somewhere else to share it. While you, of course, want people to share your content, it can be difficult to appreciate if you don’t even know where it’s coming from. However, most users will simply Ctrl + C and Ctrl + V if they want to share a link. That’s an advantage, because that means your UTMs won’t be lost that often. In addition, if those UTMs are hidden behind a shortened link, the likelihood of it being carried over through dark social is much higher. It is true that UTMs can be lost if users only copy a portion of the URL, or if the user accesses the link natively within an app. However, it’s good standard practice to make sure you have UTM parameters set on your campaigns, as you will still be able to attribute a majority of your otherwise non-sourced traffic. Unless you’re already filtering your own IP, it’s likely that you are tripping your own wires and having your own visits to your site accounted for as direct traffic. Though it might not account for a majority of your dark traffic, you and your team repeatedly visiting the same pages can probably mislead you into believing you have significant dark traffic, as well as probably raising your bounce rate and lowering your pages-per-session and total session time. Think about how many incognito windows you’ve opened to check your site – all of those visits are being counted as sessions in Google Analytics. Google provides a simple guide to filtering your own IP address, as well as the IPs of your team, to help you avoid this case of mistaken identity in your Google Analytics reports. If you’ve read this far, there’s no doubt that you have an interest in digital marketing. 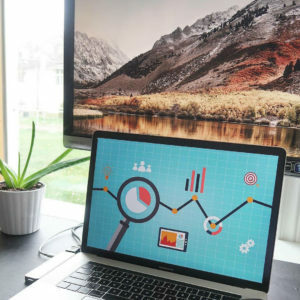 A key component of any good strategy is making sure that the data you’re pulling from Google Analytics or otherwise is as accurate as possible. Without that certainty, it is impossible to optimize anything else. If you are interested in better understanding your reports, check out our previous article on identifying keywords with strong conversion potential. If you would like to find out more about the basics of digital marketing, check out our summary on online advertising. Don’t know where to get started with your SEO? 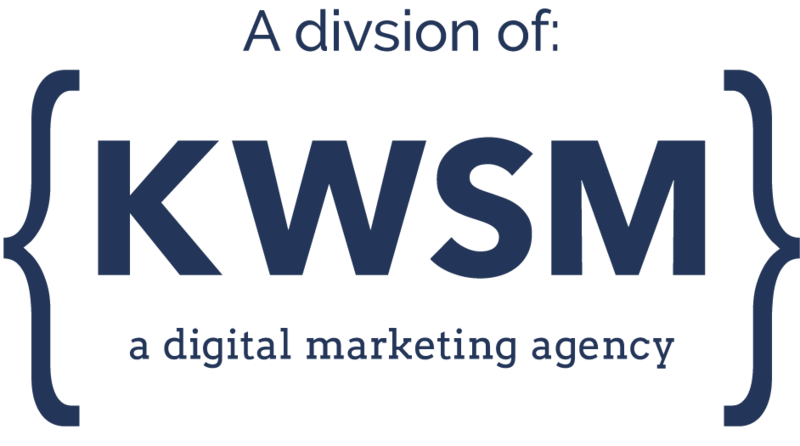 Contact the KWSM team.